A turn is a component of a knot. Turns can be made around objects, through rings, or around the standing part of the rope itself. Turns come in various forms, distinguished by the number of passes that the rope makes. A turn or single turn requires one pass. The line makes a U-shape through or around the object, or half a revolution. A round turn requires two passes and makes one and a half revolutions. Two round turns adds another pass and revolution. 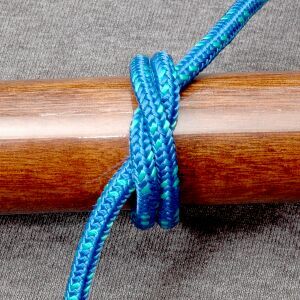 A riding turn is a section of rope that passes on top of another section of rope, often parallel or at only a slight angle to the section below. Examples of riding turns can be seen in both the Constrictor knot and the Strangle knot. The second course of wrappings in some seizing knots can be referred to as riding turns. The formation of an unintentional riding turn on a sailing winch can cause it to jam. This page was last edited on 5 October 2015, at 10:55.